What Happened to JFK's First Casket? What Happened to President John F. Kennedy's First Casket? 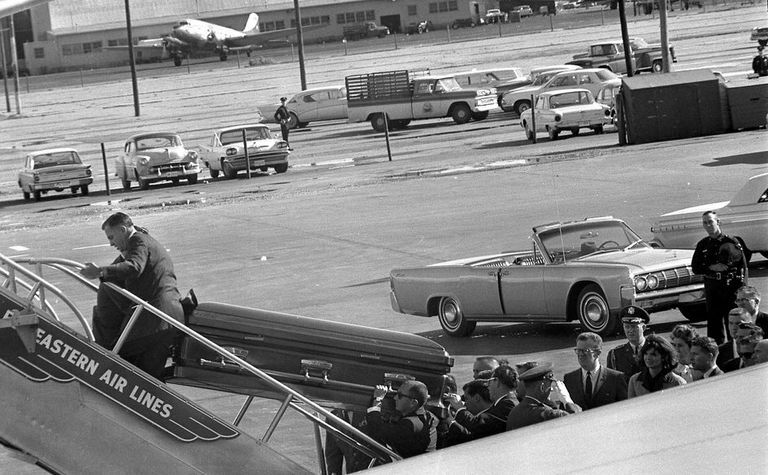 President John F. Kennedy's casket is carried onto Air Force One at Love Field in Dallas, Texas, November 22, 1963. Photo © Cecil Stoughton. White House Photographs. John F. Kennedy Presidential Library and Museum, Boston. Chris Raymond is an end-of-life and funeral expert and editor of The Director magazine. At 10 a.m. Eastern Standard Time on February 18, 1966, a large pine crate was pushed out of the open tail hatch of a C-130E military transport plane approximately 100 miles east of Washington, DC. After watching the box hit the frigid water of the Atlantic Ocean and then sink, pilot Major Leo W. Tubay, U.S.A.F., circled the drop point for another 20 minutes to make sure the crate did not resurface. It didn't, and the airplane returned to Andrews Air Force Base in Maryland, landing at 11:30 a.m. This ultimately was the fate of the casket used to transport President John F. Kennedy's body from Dallas back to Washington, DC, after the president's assassination. This curious tale concerning what happened to JFK's first casket begins 27 months earlier, however. Funeral director Vernon O'Neil selected an "extremely handsome, expensive, all bronze, silk-lined casket" and delivered it personally to Parkland Hospital. This casket, shown in the photograph above, carried the body of President Kennedy on Air Force One during the long flight from Dallas, Texas, to Washington, DC. This all-bronze casket was not the same one seen three days later during the televised funeral of America's slain leader, however. Jacqueline Kennedy wished for her husband's funeral to replicate, as closely as possible, the services of previous presidents who died in office, particularly the funeral of Abraham Lincoln, who also died from an assassin's bullet. Those funeral services usually featured an open casket so the public could offer a last goodbye to its leader. President Kennedy was therefore buried in a different casket -- a mahogany model crafted by the Marsellus Casket Company, and supplied by Joseph Gawler's Sons, the Washington, DC, funeral home that handled JFK's funeral services. After transferring the president's body to the new casket, the funeral home eventually placed the original bloodstained casket in storage. On March 19, 1964, Gawler's sent the first casket to the National Archives, where it was stored "at all times thereafter in a specially secure vault in the basement." According to an official document dated February 25, 1966 (and declassified on June 1, 1999), only "three top officials of the National Archives" and a historian commissioned by the Kennedy family received access to this casket. Meanwhile, the General Services Administration (GSA) continued to dispute the invoice that funeral director O'Neil submitted to the government for the "Solid double wall Bronze Casket and all services rendered at Dallas, Texas." Originally sent by the funeral home January 7, 1964, for a total of $3,995, the GSA asked O'Neil to itemize the goods and services he provided and resubmit the bill. O'Neil did so on February 13, 1964 -- and even reduced the invoice by $500 -- but the GSA still questioned the amount. Roughly a month later, the GSA informed the funeral director that the total he sought was "excessive" and that "the actual value of services to be billed to the Government should be in a greatly reduced amount." On April 22, 1964, O'Neil visited Washington, DC (one of two trips he made to collect this bill), and indicated he wanted to obtain the casket he provided that housed President Kennedy's body on the Air Force One flight back to the nation's capital. According to a telephone-call transcript dated February 25, 1965, and later declassified, O'Neil revealed at some point "he had been offered $100,000 for the casket and the car in which the President's body was handled from the hospital to the airplane." While in DC, the funeral director apparently indicated that he wanted JFK's first casket back because "it would be good for his business." In autumn 1965, the United States Congress passed bills intended to acquire and preserve "certain items of evidence pertaining to the assassination of President John F. Kennedy." This prompted Texas' Fifth-District U.S. Rep. Earle Cabell -- who also served as the mayor of Dallas when President John F. Kennedy was assassinated -- to write a letter to U.S. Attorney General Nicholas Katzenbach. Dated September 13, 1965, Cabell states that JFK's first bloodstained casket has no "historical significance" but "does have a value for the morbidly curious." He concluded his letter to Katzenbach by stating that destroying this casket is "in keeping with the best interest of the country." The O'Neil Funeral Home invoice still unpaid and the casket in question still securely stored in the basement of the National Archives building in Washington, DC, U.S. Senator Robert Kennedy -- the slain president's brother -- phoned Lawson Knott Jr., GSA administrator, the evening of February 3, 1966. After noting that he'd spoken to U.S. Defense Secretary Robert McNamara about "getting rid of" President Kennedy's first casket only to learn that McNamara "is not able to get release of the casket," Senator Kennedy asked what could be done. Lawson informed Kennedy that the very historian commissioned by the Kennedy family -- one of only four people granted access to the original JFK casket presently stored in the National Archives, as noted above -- was "quite outraged" at the idea of destroying the first casket. According to Knott, the historian (William Manchester) planned to devote an entire chapter of his book to "this particular subject." The GSA administrator added: "I think it is going to raise loads of questions about the release of the casket." At issue was whether the first bloodstained casket constituted "evidence" in President Kennedy's assassination, which the bills passed by Congress in 1965 sought to preserve. Unlike the rifle found in the Texas School Book Depository, however, Senator Robert Kennedy didn't think the casket "was pertinent at all to this case." After stating that "[the casket] belongs to the family and we can get rid of it any way we want to," Kennedy told Knott that he would personally contact Attorney General Katzenbach to, essentially, cut through the bureaucratic red tape and secure the release of the original casket used to fly the body of President Kennedy from Dallas to Washington, DC. Not surprisingly, Katzenbach sent a letter to Knott a mere eight days later (February 11, 1966) indicating "final settlement with the undertaker [Vernon O'Neil] who supplied the casket has been accomplished." Moreover, Katzenbach concluded his letter by stating: "I am of the view that the reasons for destroying the casket completely outweigh the reasons, if any, that might exist for preserving it." On February 17, 1966, GSA staff prepared JFK's original casket so that it could be disposed of at sea without fear of resurfacing. Specifically, among other things, three 80-pound bags of sand were placed inside the casket; after locking it, metal bands were placed around the casket lid to prevent it from opening; and roughly 42 half-inch holes were randomly drilled through the top, sides and ends of the original JFK casket, as well as the outer pine crate containing it. Finally, metal bands were placed around the pine box to prevent it from opening. At approximately 6:55 a.m., February 18, 1966, the GSA officially turned over President John F. Kennedy's first, bloodstained casket to representatives of the U.S. Department of Defense. Less than two hours later (8:38 a.m.), the U.S. Air Force C-130E military transport plane took off from Andrews Air Force Base and, as noted in the opening paragraph above, delivered its unusual payload to its final resting place roughly 90 minutes later -- where it presently rests some 9,000 feet below the surface of the Atlantic Ocean. A memo issued February 25, 1966, summarizes the extraordinary measures taken by the federal government (as detailed in this article) and includes the following assurance to the Kennedy family and all others: "The casket was disposed of at sea in a quiet, sure and dignified manner." "Memorandum for File" by John M. Steadman, Special Assistant, Office of the Secretary of Defense, February 25, 1966. Document in author's possession after National Archives released declassified documents June 1, 1999. Letter to U.S. Attorney General Nicholas Katzenbach from U.S. Rep. Earle Cabell, September 13, 1965. Document in author's possession after National Archives released declassified documents June 1, 1999. Telephone call transcript, February 25, 1965. Document in author's possession after National Archives released declassified documents June 1, 1999. Telephone call transcript, February 3, 1966. Document in author's possession after National Archives released declassified documents June 1, 1999. Letter to General Services Administration Administrator Lawson Knott Jr. from U.S. Attorney General Nicholas Katzenbach, February 11, 1966. Document in author's possession after National Archives released declassified documents June 1, 1999. "Memorandum for the Record" by Lewis M. Robeson, Chief, Archives Handling Branch, General Services Administration, February 21, 1966. Document in author's possession after National Archives released declassified documents June 1, 1999.